The Katana nameplate took a sabbatical about a decade ago. Without divulging anything, Suzuki has teased its upcoming new Katana sports tourer which is slated to make its world premiere at INTERMOT 2018 in Cologne on October 2. The video shows a traditional Japanese sword (the name Katana denotes is a Japanese sword) being hand forged, and carries a tag line “Feel the edge”. Suzuki has trademarked the new Katana logo in the US and Europe a few years ago and the latest mystery teaser pretty much confirms the nameplates revival. The Suzuki Katana nameplate came to existence back in late 70s and eventually became the branding of choice for the company’s popular GSX-R600 and GSX-R1000 models. Concept photo used for reference. As time progressed, the Katana evolved into a low-slung sportsbike before disappearing from the market about a decade ago. The resurrected Katana, like the previous generation model, is expected to be based on the GSX-R1000. While a privately commissioned exhibit by Motocilismo.it at last year’s EICMA show in Milan showed us that the new Suzuki Katana could be a stylish modern power cruiser, Suzuki’s official design may have an entirely different approach. The concept was based on the Suzuki GSX-R1000 and carried forward some basic elements of original Katana’s styling. A retro-classic appeal would put the new Suzuki Katana in the same league as the BMW R nineT, and Kawasaki Z900RS. There are also rumours that the Katana could be the production version of the Japanese automaker’s Recursion concept whose design does fit well as a homage to the original Katana. The Recursion concept previewed a turbocharged motorcycle and Suzuki has been working on a production version for quite sometime. 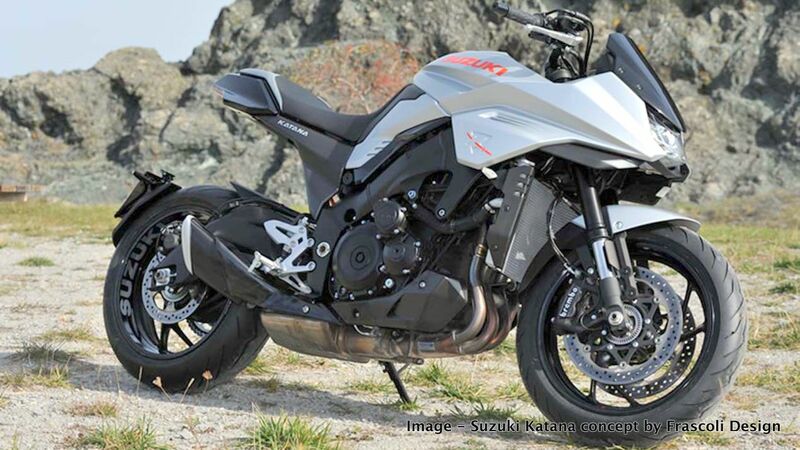 Whatever it is, the prospect of new Suzuki Katana is an exciting news for the sportbike fraternity. We will know complete details about the mystery Suzuki at the INTERMOT 2018. We at Rushlane hope that the new Katana is indeed a turbocharged warrior. © 2019 - RushLane. All Rights Reserved.